WAIT! Where's day 6? No, I haven't forgotten day 6... it's a 2 pager that uses a new release from Darcy this week so you'll have to wait until Saturday to see it :) I'm falling a bit behind but tonight I sat down to some dark chocolate brownies and scrapped 3 pages, WOOT! 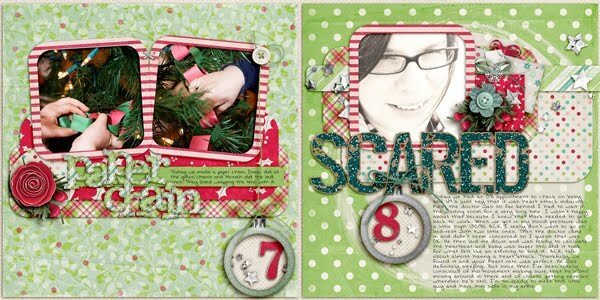 So, I was able to get caught up on some December Daily/Journal Your Christmas pages and some creative team new releases pages, YAY! I also got to spend some much needed alone time at Michaels store with a sweet little 50% off coupon, WOOT! Which means, tomorrow will be a day of crafting and hopefully finish a project I've been envisioning and working on for a couple weeks now... it's an easy project, it's just the envisioning part keeps taking me in totally different directions every time. Anyways, enough chit chat, here are another 2 pages in my book.